Wow. Will you take a long look at Lady Rhus typhina? Isn’t she beautiful ? And she is such a keeper. What gardener wouldn’t welcome this stunning, autumn beauty with her technicolor dreamcoat? But there is a catch. I am afraid this lady has a bad reputation. It’s not her fault, mind you. She hasn’t done anything wrong herself. It’s just that she comes from a long line of toxic relatives. It’s sad really. I hate to say it, but her kin will really burn you if you don’t watch yourself. They are beautiful, but only from a distance. Up close, they are quite a nasty group. 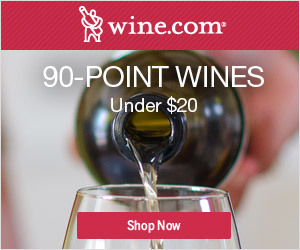 Perhaps you know the type? Maybe you have met them – I am certain you would remember. 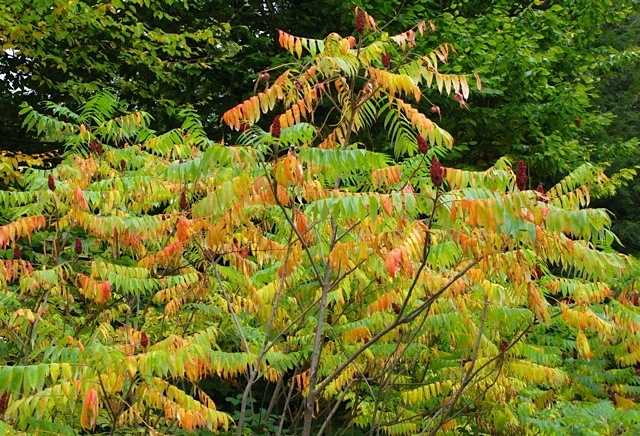 A close encounter with her two most famous cousins, Poison ivy, (toxicodendron radicans/rhus radicans), or Poison Sumac, (toxicodendron vernix/rhus vernix), will likely produce an unforgettable, blistering rash. Thankfully, botanists have taxonomically separated these nefarious relations from Lady Rhus, and this has helped to clear up confusion in horticultural circles and classrooms. But word on the street is little changed – the Sumac name still gets a bad rap. So lets see what we can do to help her out. In case you haven’t been properly introduced, this is North American native Rhus typhina, better known as Velvet or Staghorn sumac. And as you can see, she is drop-dead gorgeous. 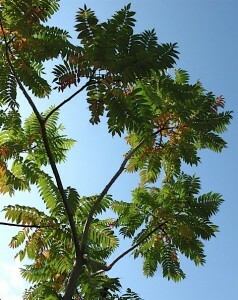 All summer long, Velvet sumac charms us with her tropical looking foliage. In fact, as you will observe in the photo below, she almost looks as if she came from a distant jungle, or perhaps an exotic South Pacific island. But she really is just the proverbial, beautiful girl-next-door. 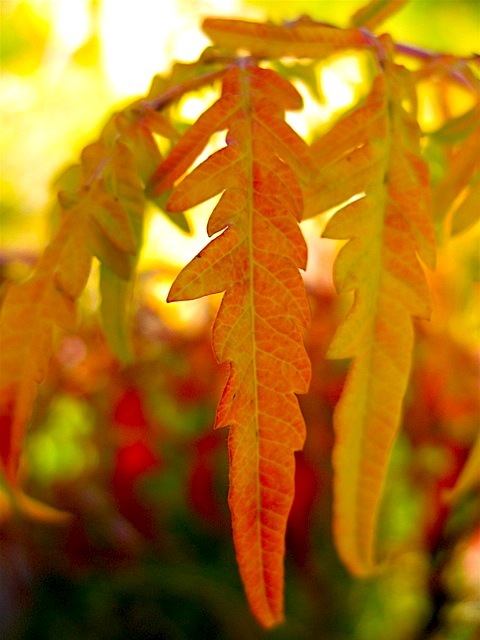 In the Northeast, when days shorten and nights chill in the latter part of the year, Rhus suddenly pulls out all the stops when she dons her autumn finery. Her cloak is quite a knock-out. Chartreuse, gold, vermillion, scarlet; impossible hues all blend together to form the most magnificent tapestry you have ever seen. She is quite the fashionista. I think she almost puts the Paris runways to shame. Rhus typhina also produces clusters of hairy fruit that turn a beautiful, dark crimson – a stand out feature in the gray days of mid November and early December. Even in late winter, her velvety stems are worthy of notice, when they catch the hoar frost and glimmer in winter light. 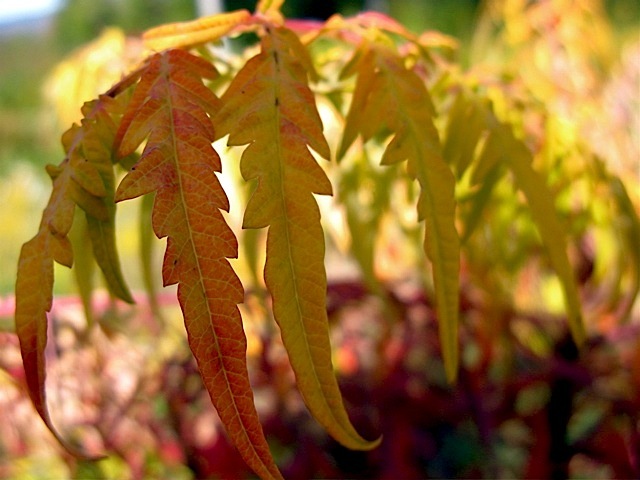 Like most wild-things, Rhus typhina must be properly understood to be fully appreciated. A North American native shrub, (or small tree), Velvet Sumac is hardy in zones 3 – 8, (some cultivars have a wider range), and can reach a height of 15-20′ or more, with a similar spread. I think she prefers to be positioned at the outer edge of a garden; perhaps alongside a drive, or a natural boundary. Although this is a suckering plant, and perhaps a bit coarse in winter, she is easy to please and quite benign. Only her name, not her human-compatibility, has been tarnished by the poisonous members of her family. Fantastic cultivars, such as the featured Rhus typhina ‘Tiger eyes’, and hybrids, (often crosses between R. typhina and R. glabra), like ‘Red Autumn Lace’, have proven to be fantastic garden plants. Just imagine the beautiful color combinations in an autumn garden. Violet, magenta and cerulean Asters; deep purple monkshood, (Aconitum); golden Amsonia; ornamental grass – the possibilities are limited only by imagination. 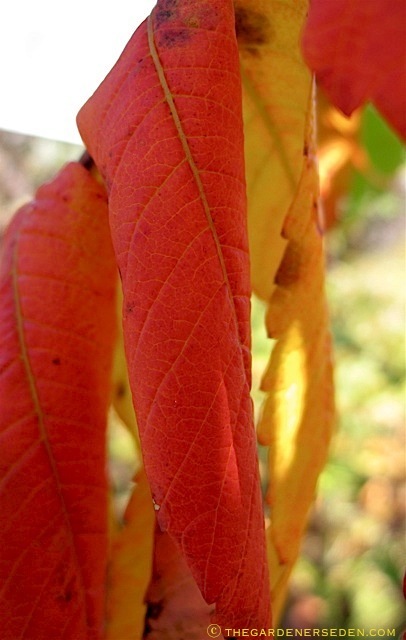 § 6 Responses to Behold the Beauty in a Technicolor Dreamcoat: Rhus Typhina, our North American Native, Staghorn Sumac…"
We are heading northward in 3 weeks to the Ozarks for a vacation and I can’t WAIT to see the foliage colors such as this. We don’t get these gorgeous colors in Texas. Hi Michaela, Went back to read this when you mentioned it in today’s post. 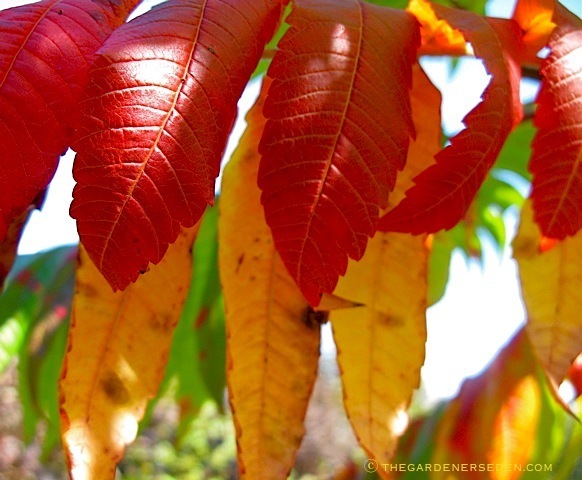 Staghorn Sumac is one of my absolute favourites, but not just for it’s amazing coat-of-many-colours in Autumn. Sumac “Bobs” are the beautiful red-burgundy fuzzy fruit that feed birds all winter long. They can also be used to make pink Sumac tea which has a wonderful lemony flavour and is chock-full of Vitamin C and Bioflavonoids – sweetened with lots of honey, of course! This is my favourite fuel for burning in the bee smoker, taught to me by my Dad as it was handed down to him from generations of beekeepers past. Not all of the tiny fuzz balls are burnt and I like to think of myself as a kind of ” Johnny Appleseed of Sumac” as they bounce and roll off the tailgate of the truck as I tap the ashes out my cold smoker. You are currently reading Behold the Beauty in a Technicolor Dreamcoat: Rhus Typhina, our North American Native, Staghorn Sumac… at The Gardener's Eden.